The impact of faith on multiple broken lives is played out in this powerful new movie from the makers of God's Not Dead. An ensemble drama that follows that pain and perseverance of different men and women who encounter the titular question, the film is a challenging drama and great resource for Church and family movie nights. When a pastor, one late night, is driving home he encounters an old street preacher who's literally carrying his cross. When asked the titular question, the pastor gives the obvious response. Yes. "If you believe, then the question is, what are you going to do about it?" the old man replies. The films central challenge, acting on faith sets into motion stories which cross and recross. Stories of hope and despair, of persecution and perseverance, or seeing the world with God's eyes and living as a response to that shift. Do You Believe is a film that demands a response. It addresses real issues in the world, both secular and spiritual, and explores how we can live out belief. Whether it's a paramedic seeking to save someone on the cusp of death, or a young man torn between his violent past and an uncertain future, or a doctor with a God complex, the film's character each have something to say. They speak of the need not only to say 'I believe', but to follow those words with actions. Carry your cross, to hold it and live your life as a witness to all it represents. Perfect for Churches, whether in small groups or sermons, Do You Believe? Is a powerful tool for challenging faith in any believer. Do You Believe DVD was published by Kingsway Trust in July 2017 and is our 509th best seller. The ISBN for Do You Believe DVD is 5060192818215. Be the first to review Do You Believe DVD! Take a peek at some articles related to Do You Believe DVD. Got a question? No problem! Just click here to ask us about Do You Believe DVD. I wouldn't normally watch a film that was a 12. Is there bad language, fighting... Why isn't this a family film? Thank you in advance for your reply. A:The BBFC rated this film as a 12 for moderate violence, threat, and a car accident. If you would like more detail, the BBFC's website detail why they give films their ratings, but there are occasionally spoilers to the plot in the descriptions. Thank you for using the Q&A Forum. Going be region 2 not region 1 as USA. A:This DVD is going to be Region 2 (UK/Europe). We will not be stocking the Region 1 edition of Do You Believe DVD. Thank you for using the Q&A Forum. A dozen different souls--all moving in different directions, all longing for something more. As their lives unexpectedly intersect, they each are about to discover there is power in the Cross of Christ ... even if they don't believe it. Yet. This stirring new film from the creators of God's Not Dead. 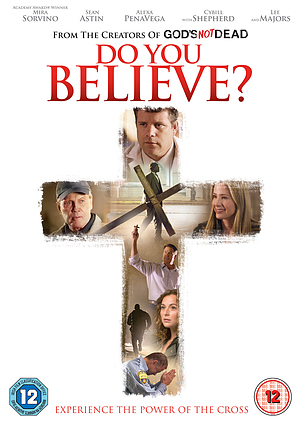 More than a movie, it's a question we all must answer in our lifetimes: DO YOU BELIEVE?